Bishop Cuthbert is the vicar's cousin. He has been away from home for some considerable time on a long holiday - a world tour! He had to leave his poor pet dog, Bardsley, behind to be looked after by the vicar. 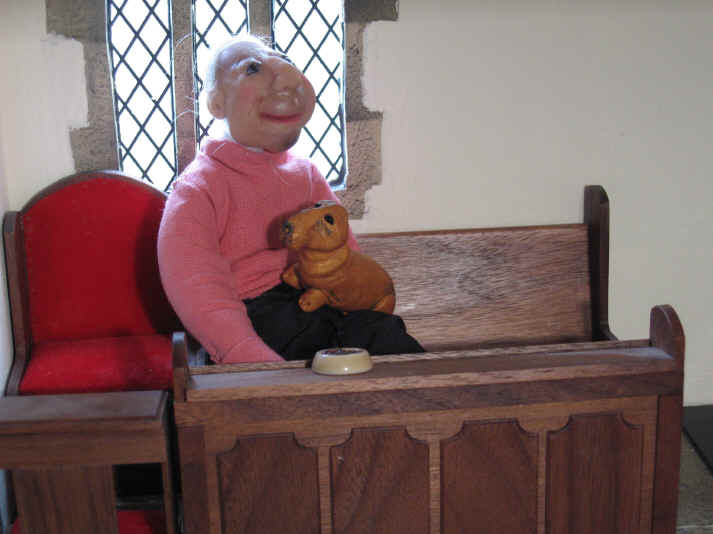 Bishop Cuthbert is now home.............see how he gets along when he meets his dear pet dog, Bardsley, after all of this time away! Bardsley was SO thrilled to have his master home that he HAD to leap on to his lap for a cuddle! Poor Cuthbert though. He is feeling VERY guilty for leaving poor Bardsley for so long whilst he was on his extended travels around the world. So he has bought Bardsley a real treat in order to make up to him for leaving him for so long.......can you see what it is? It is a NEW dog bowl. However he has also put some luxury dog food in it for Bardsley as a special treat! Bishop Cuthbert has decided to put the dog bowl on the floor so that Bardsley won't make a terrible mess by getting dog food on to the lovely choir stalls! Oh dear! WHAT has happened here? Belle and Georgie could smell something delicious in the chancel and had hot footed there to see what was going on! 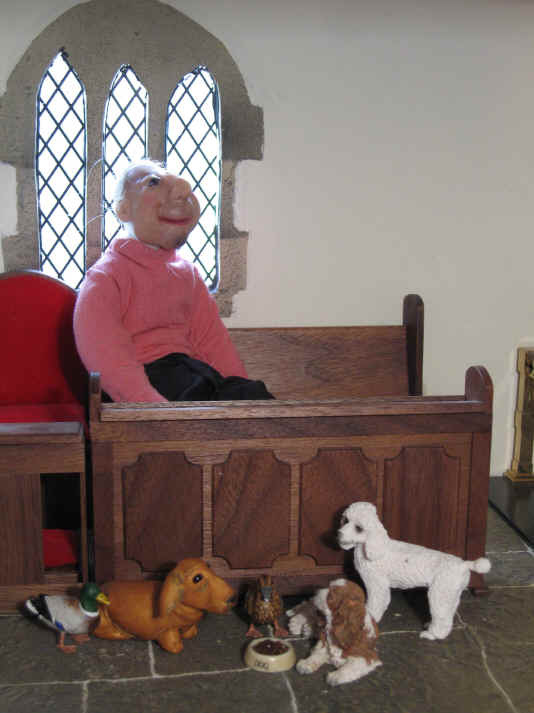 They soon homed in on the lovely luxury dog food that Bishop Cuthbert has given to Bardsley.........poor Bardsley! Can you see that some pets can't read? It is Esme and Ernest, the local mallard ducks who live in the local village pond. THEY think that the word "dog" is really "duck"!! Bardsley and Belle do their best to put them right but they are NOT having it! We hope that they don't try to eat it........because we know that they will HATE it because it has got no nice duck and swan food in it......not even a tiny bit......AND it is the wrong colour too! 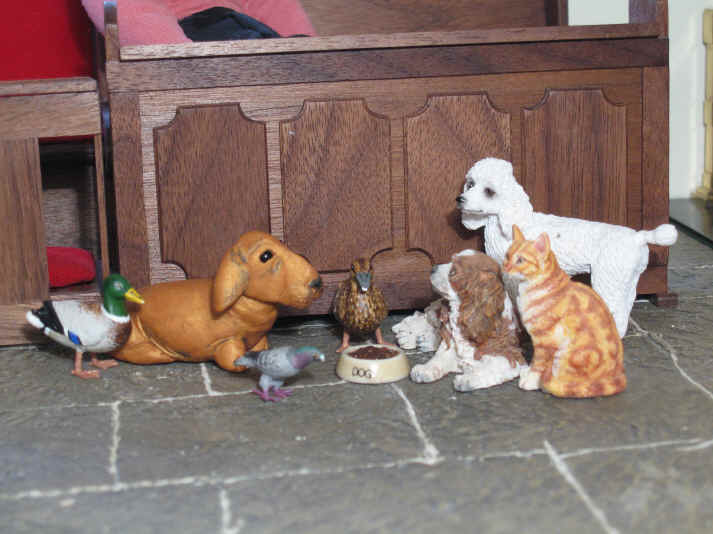 Even Magnifi-Cat has smelt the dog food and has come into the chancel to see what is going on! Syd too has come along to join in..............he had NO idea what was going on but if Magnifi-Cat was here then it MUST be interesting! The vicar has asked his cousin, Bishop Cuthbert, to give a little talk to the children about his travels around the world. Megan has never met Bishop Cuthbert before and she is transfixed when she sees him for the first time. She has NEVER seen such a tall man in all of her life..........EVEN taller than their own vicar! 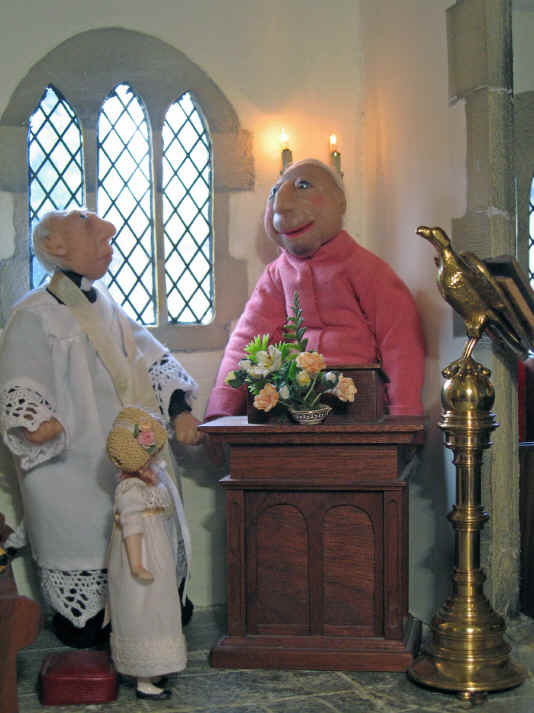 She asks him why he wears a pinky/purple shirt as she has NEVER seen their vicar wear one. Bishop Cuthbert explains that ALL bishops wear this colour of shirt with their dog collar. This means that, when someone sees them, they will know immediately that they are bishops. 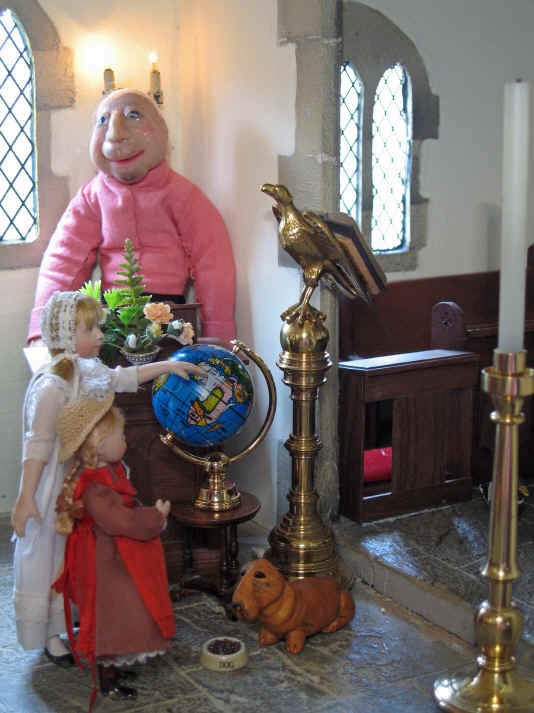 Bishop Cuthbert asks Alice to come up to the front and point to the country on the globe when he is speaking about his travels in that country. Here you can see she is pointing to Africa. The bishop tells them about all the wonderful animals he saw when he went out on a safari whilst there.........lions........tigers.............elephants............goodness he had problems remembering them all! The children really enjoyed hearing all about the bishop's travels around the world! Bardsley, however, has not listened to ONE word of his master's talk to the children. Instead he is enjoying lapping up his luxury dog food in his lovely new dog bowl! Many thanks to Rachel for making Bishop Cuthbert and his pet dog, Bardsley for us. The names I have chosen for them are significant as it was actually the then Bishop of Coventry, The Right Reverend Cuthbert Bardsley, who confirmed me in Holy Trinity Church, Coventry when I was approximately 13 years old. We hope that his family appreciate our choice! Many thanks to cousin Stephanie for making Bishop Cuthbert's shirt! I, Sarah, made his trousers which was a first venture back into dress making again after having lost my confidence after having an accident cutting one trouser leg off a pair of pyjamas which formed a school needlework project when I was 13! Both the shirt and trousers are taken from a pattern by Sue Harrington. Catherine Davies has made the "Pedigree Chum" dog food in the dog bowl she bought especially for St. Hilary's after she learnt that the poor pet dogs had no bowl to themselves in church!